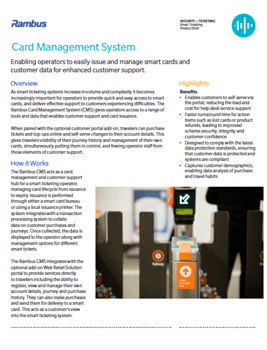 The Rambus Card Management System enables operators to easily issue and manage smart cards and customer data for enhanced customer support. When paired with the optional customer portal add-on, travelers can purchase tickets and top-ups online and self-serve changes to their account details. This gives travelers visibility of their journey history and management of their own cards, simultaneously putting them in control, and freeing operator staff from those elements of customer support. Download the product brief by completing the form on the right.